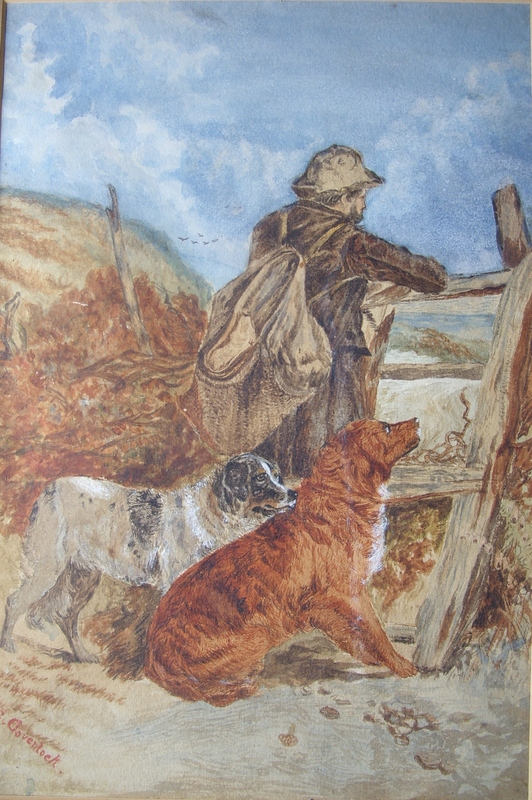 Dogs appear in art both as subject or background. As with the human form, the depiction of animals is not easy. The misalignment of a single line can make very very fine rendition into an abstract view. We, not just artists, like to humanise our animals giving them human qualities which endear them to us or alienate them from us. Certainly it is said regarding dogs that they look like their owners. ‘Man’s best friend’ has worked in coordination for centuries. Hunting, herding, befriending, guarding are all jobs which dogs lovingly provide to their masters. The pair of setters to the left are performing something they would do naturally but they do it in conjunction with their master. This watercolour in it’s warm autumnal colours and lovely depiction of a pair of hunting dog is ‘after #ReubenWardBinks’. Mr. Ward Binks was one of the foremost illustrators of pure bred dogs. He travelled the world to perform commissions for dog owners and worked for some of the most influential people in the world. The dedication to their master can be seen here in a painting by #SGovenlock. Is he a traveller? Does he have a home? The dogs do not care . Their devotion is to the man not to their comfort. Happy wherever the man is – they follow. I believe this painting to be from the 1920’s or 30’s. I picked it up in Canada recently. Is this an image of William Govenlock overlooking the land in Saskatchewan that he would homestead in 1910. Later a town(1913) formed and was named ‘Govenlock’ after its’ founder. The town prospered during the years of prohibition due to its’ nearness to the border and bootlegging. Its’ decline began when prohibition ceased and with the provincial control of spirit sales. Today, Govenlock, is no more, a ghost town with only cement foundations and a few wooden walkways remaining. These beautiful and devoted animals are lovingly portrayed here doing what they love to do – please their masters. Whether as companion or fellow worker they live not for themselves but for another. Maybe that’s why I love dogs. 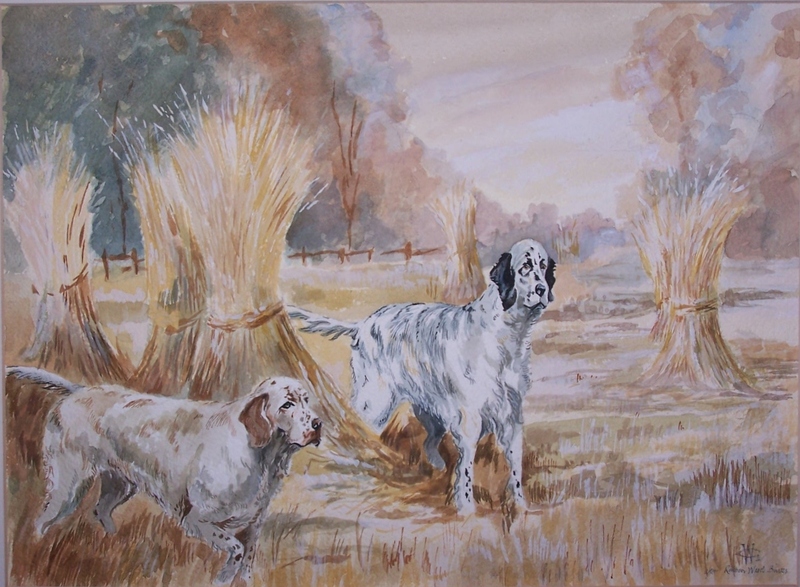 This entry was posted in Watercolour paintings and tagged fence, Govenlock, hobo, hunting dogs, pointer, prairie, Reuben Ward Binks, setters, sheaves, style, traveller, vagabond. Bookmark the permalink.